In the Kampfgruppe Normandy rulebook they suggest using dead figures as suppression markers – great idea! I made a test where the aim was to make it look like the soldier was hit by artillery barrage. I have used pigments and gravel to make it look like debris covering the body. After starting to repaint many of my figures I have been busy. Here is two platoons, one US and one german plus some extra teams. Tonight I finished this Kubelwagen that I built ages ago, at last I felt the urge to get this done. Hope you like it. We will soon get new rules! After Warhammer Historical closed down the author of Kampfgruppe Normandie, Warwick Kinrade, has put together this new set rules that claims to be even better than Kampfgruppe Normandy. I am very positive about this and have already pre-ordered the book that will be out in September this year. If you are interested there’s an idea in pre-order the book now already as the first 500 to order gets a free gift and enter a prize draw to win £200 of Plastic Soldier Company products of own choice. Read more and Pre-order the rulebook here! 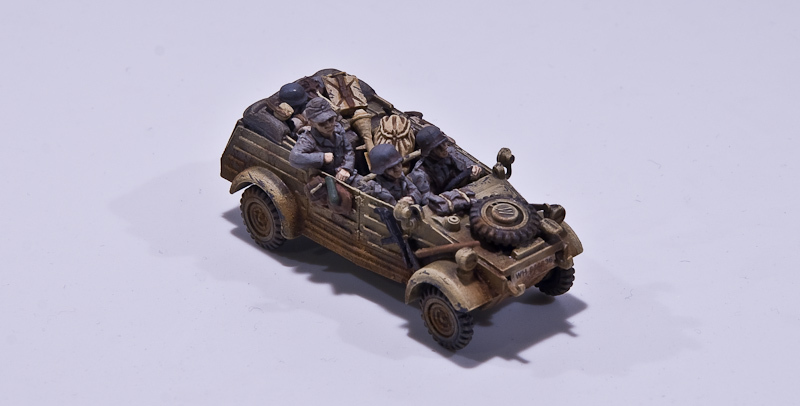 As I started to repaint my germans I also wanted to make sure I have vehicles for them if needed. So while I have made 3 new Sdkfz. 251/1 (and at least 3 more on their way, maybe six), I’m also refreshing some of my old stuff. I got a Stummel which I’m quit happy with but that needed figures – that I have fixed. 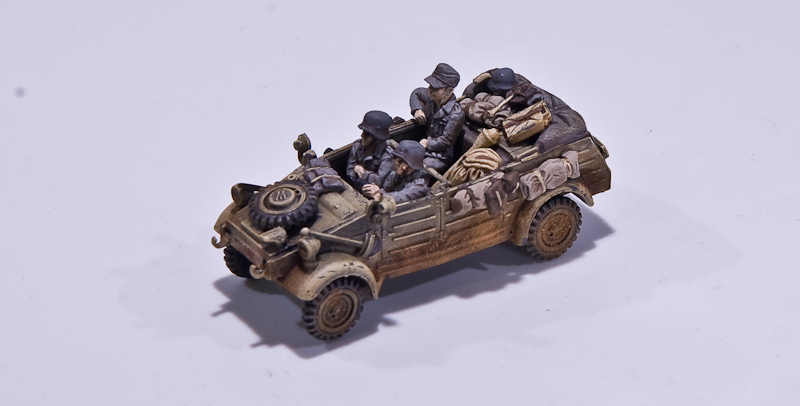 I have been experimenting with some new techniques (oil paints and pigments), this I have done on an old Sdkfz. 251/1. Maybe I’m not too satisfied with the result, but I feel that the techniques can be very useful and will make my vehicles more beautiful in the future. I’m also making a Sdkfz. 250/3, from Italeri together with a 251/7 and a 251/10, both from Dragon. The Dragon models are highly detailed, which is very cool, but it takes time to build them. And finally I’m also painting a US squad – I have to do several things at same time otherwise I’m too bored. Lately I have been doing Splinter Camo on several germans without being very happy with them. This german is the first that I feel good about, not that it can’t be done better. 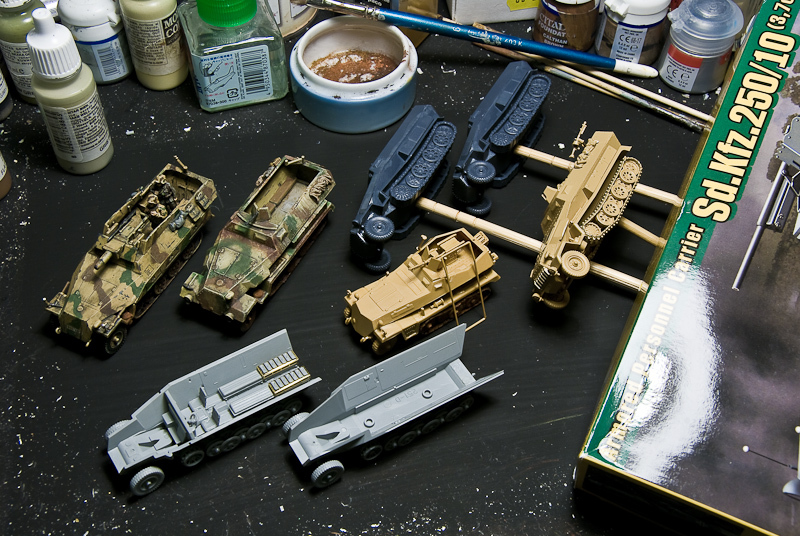 I have been testing to paint weathering with oil paints on this Sdkfz and also adding pigments to the tracks and wheels – techniques that I’m sure will make my vehicles look better. More US troops on their way to Normandy. They need 5-6 more colors, then I have to “dip” them and as a last thing give them a layer of Dull Coat. But now, several days later the first platoon is ready. I go for a company so there’s a long way to go. At the same time I paint GI’s and will do fallschirmjägers and SS too. Sometime in a near future I want to do british too. I paint my figures for wargaming, so I keep detais to a minimum. I use 12-15 colors, I use Army Painter and give them at least one layer of dull coat, usually helmets get some extra layers as this is the first place to loose paint. HQ plus a sniper to the far right. 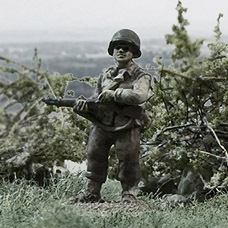 He’s a tank rider from the AB Figures range modified to sit on his knees. I have also added a gun sight. He’s jacket is borrowed from the SS to give him better concealment.